Can I view Sarina’s original works? Yes, only catch is Sarina’s studio is based in Clontarf, Sydney, Australia. You’re in luck if you live nearby, otherwise you’ll need to rely on electronic imagery. Can artworks be collected from the Sydney studio? Yes – a great espresso coffee also awaits! Is Sarina available to do commissioned work? Yes, Sarina can do commissions. If there’s a particular subject matter that you feel would be suited to Sarina’s distinctive & unique style, just send her through some pics and any other relevant details (such as desired size) and she’ll let you know if it’s something she’d be able to do. How do original works get shipped? We have established relationships with companies that specialise in the packaging and freight of artworks. Once we know where a particular work is destined, we can arrange quotes for packaging & shipping. If you’d prefer, we can get artworks professionally packaged then you can arrange your own shipping. How can I pay for my artwork? We have credit card facilities, Paypal or we can provide bank details for direct deposit. 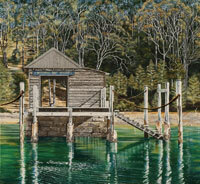 All artworks are quoted in Australian Dollars inclusive of a 10% goods and services tax. Any artwork that is to be exported from Australia, would be sold excluding the 10% goods and services tax however the purchaser would be responsible for any duties and taxes levied on such artworks by the country of import. How can I purchase Sarina’s placemats?